Discussion in 'Dell XPS and Studio XPS' started by proless, Aug 3, 2018. After all that the issue remains i have some picture to show my temps while gaming cs:go medium setting when i am in game cpu throttles i tab out to desktop everything goes back to normal no throttling ????? (note that this happens only with IDPTF installed, when it is not installed cpu just stays capped for a few mins even though temps are not very high ) can anyone tell what is wrong with my XPS, i can't do anything but IDLING!! !, browsing and some coding without it throttling. Everything is updated to latest i even did fresh windows install, i have the i7, FHD, 960m configuration. the blue highlighted text (Fuses Limit,..) kicks in some times randomly and always when i stress test the system specifically with Aida64 what is the reason for this limit ? is it normal ? Note: all the issues mentioned above started after i got my xps back from repair, dell replaced the motherboard because of a defective GTX 960M. before that i was able to play the witcher, gtav, csgo at high settings for hours without any throttling whatsoever. is it a software or hardware problem ? That PL1 limit at 7W is very very very low. You are probably constantly hitting that power limit. Perhaps you installed the wrong version of IDPTF? Do you have the DELL power management in some sort of Quiet mode? I guess it is PL1 throttling due to the first Ambient on Dell EC (which is the VRM sensor near the narrow grille between the exhausts) in the seventies. Probably not enough? Did you try disabling turbo when gaming? There is also the PL4 flag which is not clear to me. 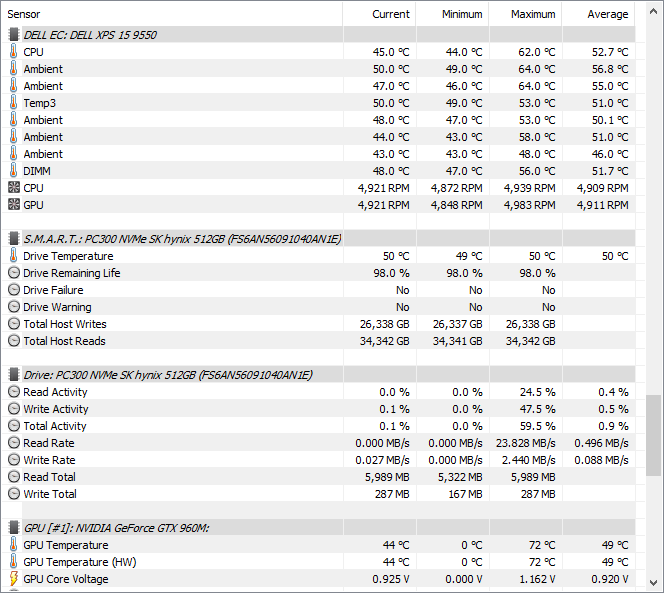 i didn't try disabling turbo i will but can anyone tell me what are the temps (CPU,GPU, Ambient) for throttling to start ? 1. I think the -170 undervolt for the CPU core & cache are too aggressive for the 6700HQ. Search the forum but I think around -150 was about the best people could do without strange problems. Also, if the undervolt is too high the CPU will just ignore your request. The 6300HQ could be undervolted to -170 but that is a different beast. It has been a long time since I looked so do some research to confirm. 2. Your SpeedShift does not seem to be set. The main ThrottleStop screen shows you have checked SpeedShift with an EPP of 64. But I don't think that is set (you would see the letters "EPP" in green on that first screen and TurboFIVR screen would show SST EPP with a number in the upper right hand chart). One way to set SpeedShift when you open ThrottleStop is to check the two boxes in the TurboPowerLimits screen. 3. Why did you choose 64 for EPP? 0 is highest performance. 255 is lowest energy consumption. Around 75 (but you need to test on your CPU) will permit max turbo clocks but also ramp down CPU. 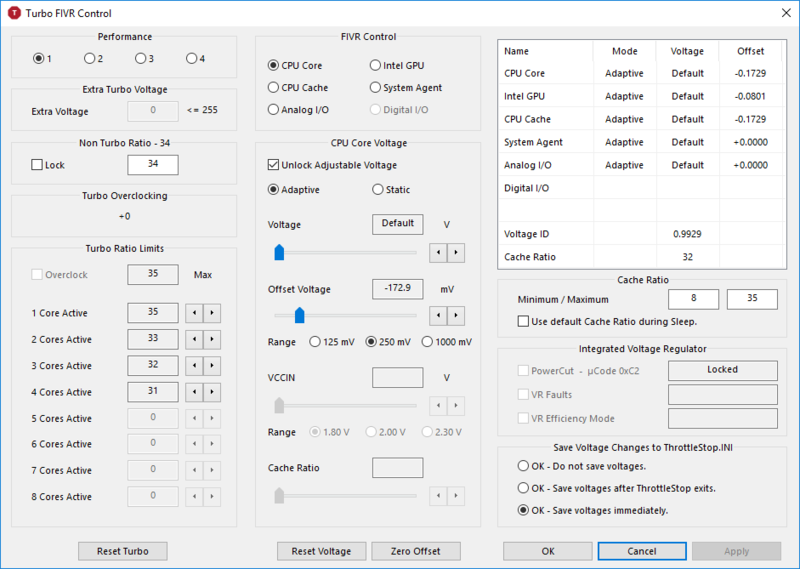 There is a detailed thread called XPS SpeedShift here for more info. 5. 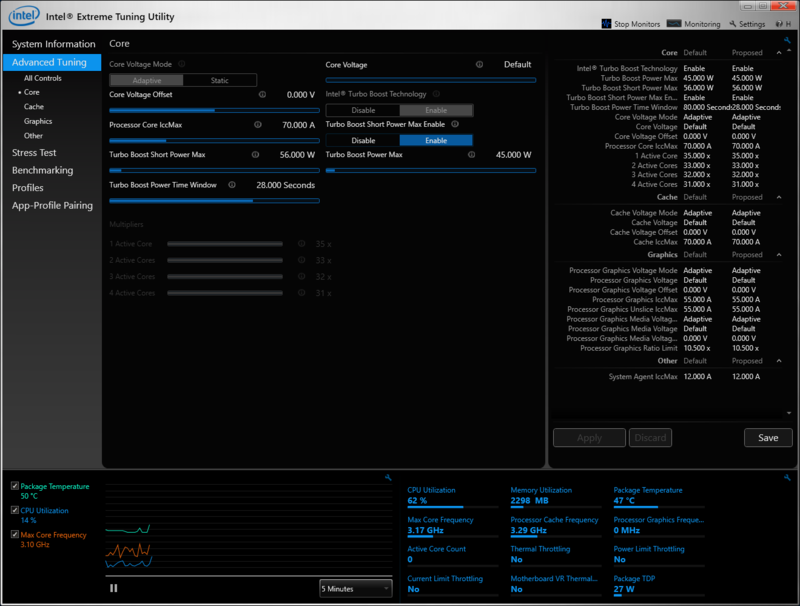 In ThrotttleStop TurboPowerLimits screen, there is a section called "Intel Power Balance". I don't think it is super well documented but you can find some information in the ThrottleStop guide. 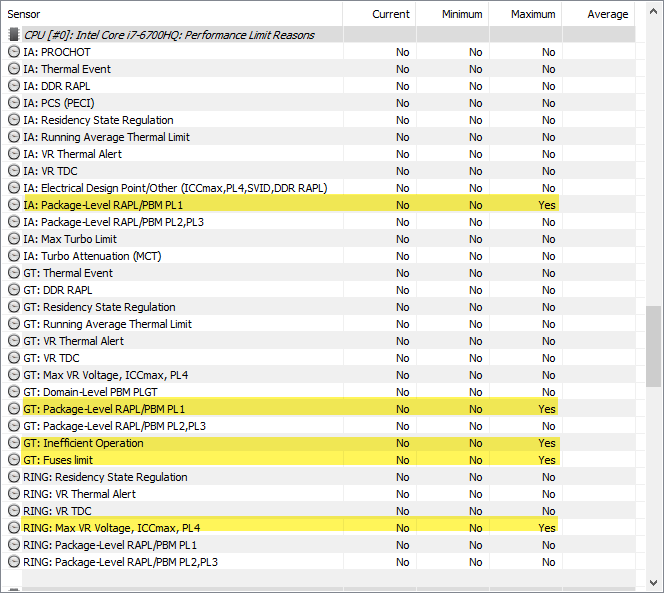 I boosted power to my CPU (I checked the box and set intel CPU=31 and intel GPU=13). You might try messing around with that. Frankly I can't remember many details there. 6. FYI - If you are running ThrottleStop, you can not run XTU at the same time or there will be conflict writing some registers. XTU is rather buggy with the 9550 for some reason. 7. That PL1 limit of 7W is wonky. ThrottleStop can not change that as it can not access third registers but XTU can. Close ThrottleStop. Open Intel XTU and reset to factory defaults. Close Intel XTU. Restart computer and see if that worked. If not, open Intel XTU and manually set your PL1 and PL2 and save. Close Intel XTU and restart. Don't use Intel XTU afterwards if possible. 8. Your short/long turbo time limits are also too short. 9 You can set windows power options to "high performance" if that is available on your version of W10. SpeedShift should override this but you never know. 10. One you get sorted you can use XTU to boost watts & turbo time limits. Close out XTU Make sure the settings match in ThrottleStop. 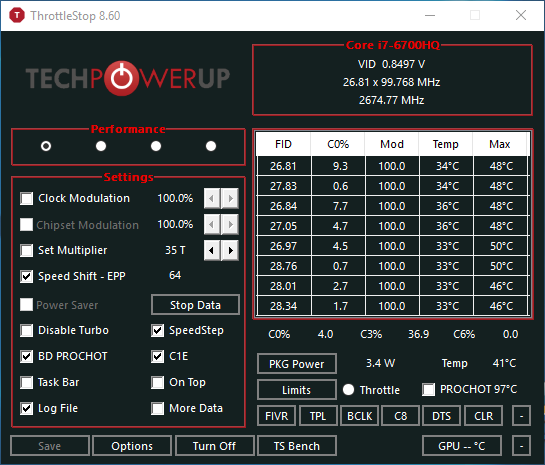 I run a 6300HQ at 65W PL1, 65W PL2 with max turbo time available in XTU and that kills virtually all throttling; you will have less headroom with a 6700HQ due to poor heatsink in the XPS. That first ambient sensor starts throttling around 76-77C. That may show as a power limit flag rather than a temp flag so is a bit tricky. 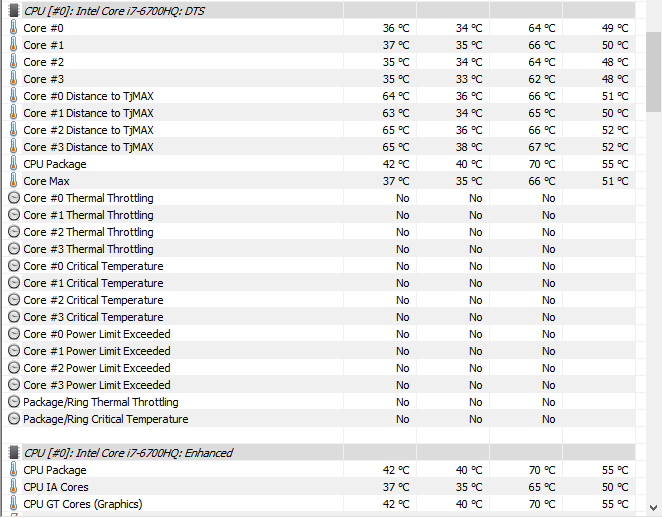 I think the DIMM might throttle things when temps hit around 62C on these. That is a big gate for the 9570 but I think I saw it happen on the 9550 also as a "backup" gate which people rarely hit. 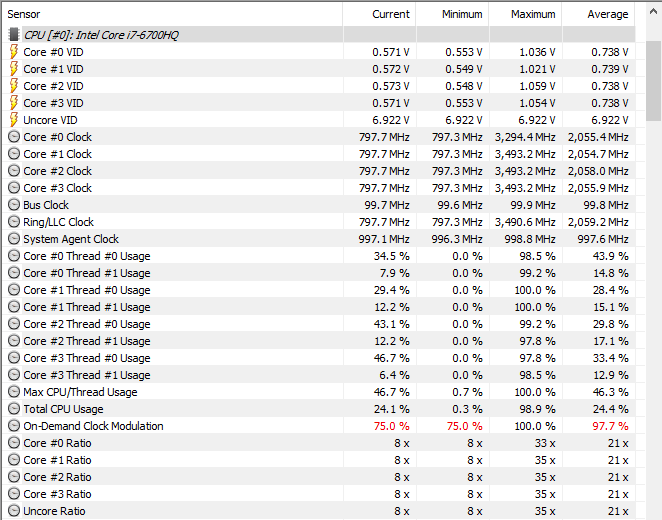 For sure the Intel starts locking down the CPU around 100C. Dell has plenty of other gates but they are not so problematic on the 9550. More details in the forums. I know this suggestion doesn't sound appealing We could also suggest you to do the iunlock's mod to take care of the temperatures in the VRM area more properly. But I understand many gamers are happy with simply turning off CPU turbo, so that the GPU more likely can run unthrottled. Or maybe you find your problem is different. Did you try disabling turbo when gaming?